My workshop finally has working facilities with hot and cold running water. The antique sink is back in action but I need to find it a plug. I am delighted at all of these modern conveniences but I will have to make time to paint the walls and floor in the loo and we have just lost an hour already this week with the clocks changing. I also have to deal with a massive backlog of laundry since the washing machine was out of action while all this plumbing went on. I will have to train the children to fold and iron for pocket money. Trading Standards did an excellent job of chasing the company that owed me money for the returned office screen. However, the refund will go out of my bank account again immediately to pay for an abnormal quantity of Velcro and cotton tape. A box of spares arrived from APQS for me to try to sort out my Stitch Regulator but I really haven’t got time to stop quilting and do servicing. I am doing most of the quilting in manual mode and only using the temperamental SR for Quiltazoid circles and spiros. I have been enjoying using it this week to give me big chunks of circles that can be filled in. One of this week’s panels was loosely inspired by old Welsh quilting designs. I have managed to quilt 3 panels this week, including Cindy’s “Train Wreck” panel and currently only have 2 completely unquilted panels in my workshop. There are others in transit but it is nice to think that I am making good progress. I would like to bind all of these during the week and then I will have done more than 50% of the wall panels myself – the rest will have been done by Stunt Quilters. I now have 2 Stunt Crocheters who are making circles and rosettes to use as embellishments on some of the panels with circles. I had made some covered buttons but they don’t sit flat enough and tend to dangle down a bit. I am still determined to conquer my crochet dyslexia one of these rainy days. 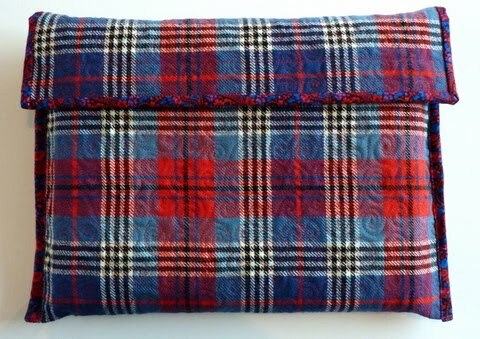 I went off on a bit of a tangent when I decided to look at laptop bags on the Internet. There were some boring functional ones and some very funky but expensive ones. I decided that I could run one up despite being a bit busy. It didn’t actually take all that long once I decided what to do based on a school reading book bag. I think it could be enhanced with a bit of lace or a crocheted flower but I can do that later on. I was about to book a train down to Glasgow to meet Tracy for the start of the USA trip when a national train strike was announced from April 6th. I looked up “Megabus” and found that the journey is the same length of time and far cheaper. As long as I can get my luggage on board, I don’t mind how I travel. After spending every day and evening in my workshop I went on a trip to Aberdeen with Mo on Friday to buy some gear for the trip. We have been friends for several years but amazingly, we have never gone on a clothes buying expedition. It was very successful and she persuaded me to get a couple of things that were nicer than I would have chosen if I had gone by myself. We were very impressed with Debenhams which is a shop that I usually walk past – there were Betty Jackson and John Rocha concessions that we really liked (as I sit here on Sunday evening typing in my old jeans and striped hippy jumper). I could have bought silver lame knickers in Primark but settled for cotton out of comfort! We managed to spend all day in town, also managing to buy the paint for the Yurt door and a litre bottle of gin for my suitcase. I was chatting to another Mother at school swimming, telling her about my week. She said that it was making her feel stressed on my behalf. I ordered my thread on Monday and asked for it to be sent by first class post. It still hadn’t arrived on Wednesday so I felt obliged to shout at the Postie, although it wasn’t his fault. I did apologise and I was actually shouting at him for leaving the garden gate open. Bloody Mabel spotted the opportunity to chase hens immediately but luckily I managed to run after her and grab her in time. It suddenly occurred to me that I had an extra week to get ready for LLQS because I had convinced myself that it started a week earlier. This was very lucky as the DWR was taking much longer than planned with no sign of the thread arriving. I received tremendously exciting news that gave me something else to do. The American Quilter’s Society has expressed an interest in the Yurt project and is looking into whether it would be possible to exhibit it in the USA – and I may have to write a book about it too! It is impossible to describe how shocked and amazed I have felt all week. I cannot yet mention what is planned until everything is all settled. I have started looking into the logistics of shipping and getting sponsors. I will have to complete the whole Yurt, drive my empty Landrover to the weighbridge at the local stone quarry, drive home, fill it up with Yurt and get it weighed again. I also have to get a certificate to declare that the wood was all treated to USA timber standard IFPW15. I have written an outline introduction to the project, trying to pull together all the reasons for doing it and all of my sources of inspiration. Meanwhile, George the Builder has been working in the studio to put in the loo at last. This involved cutting trenches in the concrete floor and creating lots of dust. In case I had illusions of grandeur at the thought of becoming an internationally renowned quilter, I had to try and help find the missing stopcock, buried somewhere under the driveway, in order to turn off the water supply. This is the one that Mo, Tania and I were looking previously with the divining rods. We had found the general location but not the actual underground tap. George looked very sceptical as I wielded my rods in a gusty breeze. He dug 5 exploratory holes but found nothing. We eventually figured out how to use the outside tap as a temporary stopcock. The DWR thread arrived at last so I was able to quilt at warp-speed to try and make up for lost time. When I could no longer feel my elbows, I wondered why I had thought it was a good idea to micro scribble around every wedge so that it would look like lace. On Friday I almost broke my leg… I had put Bloody Mabel on a lead since she has now realised that Tania has a pet rabbit. I was thinking about what I could put into a Yurt book while clambering over the broken wall when Mabel jerked on her lead and my Welly Boot got caught. I had visions of falling over backwards onto some granite boulders so did an acrobatic spin around and landed very heavily on one knee, still holding the dog lead. I was quite dazed for a few moments and Mabel apologised by slobbering on me. Surprisingly, I got up and walked back home, cleaned out the hens, drove to the Post Office and it didn’t hurt at all. I still had a lot of work to do on the DWR so stood and quilted all afternoon but as the day wore on, my knee became rather painful. I took some Nurofen and rubbed on some Arnica cream but eventually I was lurching along the quilt frame like Quasimodo, muttering expletives of pain. I could hardly walk and a friend wanted me to go to Casualty. I declared that it couldn’t possibly be broken just 2 weeks before I fly to America so decided to put up with it and I would just have to hire a mobility scooter to get around New York. After walking like a pirate with a wooden leg all weekend, it is finally feeling better. I hobbled around the workshop on Saturday, eventually finishing the DWR and to my great relief, the customer was delighted with it. I managed to piece another Yurt panel, inspired by the winter colours of silver birch trees. I shouldn’t admit to taking shortcuts to save time… but instead of using setting triangles at either end of each row, I simply chopped the end triangles in half and I seem to have got away with it. My last lot of backing fabric shrank drastically when it was dyed so it will have to have extensions added to make it big enough and I will have to order even more dye. I am getting to the last of all my Yurt fabric stash so the last couple of panels really will be a patchwork of what is left over. If I had properly worked out how much fabric was really required at the beginning of this project, I would have thought there was a fault on my calculator! I was going to write that it has been just like Spring here except that it IS actually Spring. Because we have had snow on the ground for so long, I thought it was still January so I was a bit shocked when I noticed that it was mid March. However, this does not mean that winter has gone in Scotland. I am getting a couple of eggs a day from the hens and soon I will shave all of Bloody Mabel’s wiry coat off. She gets 2 itchy, bald patches every year but I didn’t want to give her a radical haircut when the temperatures were so low. It seems as if all of my days have begun to blur into each other. I was very ashamed that I forgot that I was supposed to give a talk to the Women’s Rural Institute at the Echt Bulb Show when I agreed to attend the Quilters’ Guild Scottish Regional Day in Perth. 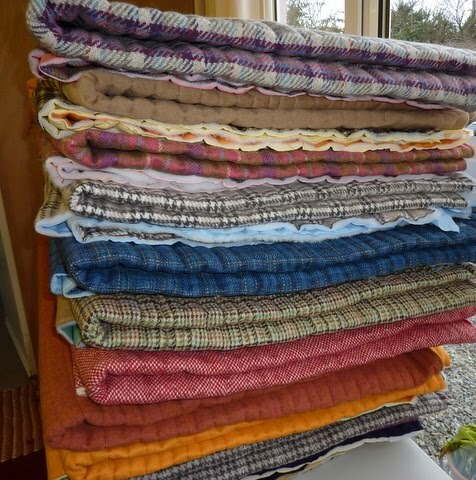 I managed to finish quilting all of the tweed roof sections, 3 yurt panels and bind 4 of them which was good going. I started to do some accent embroidery when my very expensive Husqvarna sewing machine decided that it could only sew straight lines. I phoned to see if I could troubleshoot the problem and was asked if I had been sewing anything heavy duty recently. It looks like I will have to send it away for a service and possibly get some repairs done. I had to use rickrack to hide the wonky stitches that it produced. Mo came back from her great trip to Georgia full of felting ideas but most aggravated that airport staff at Heathrow confiscated her duty free gin. She helped me to cut out and man-handle the tweed roof sections through the overlocker. Neither of us is particularly scientific or mathematical but we had to work out circumferences of the yurt and the crown using Pi and a calculator. We had lots of diagrams and scribbles on a piece of paper to work out how wide to cut the roof wedges. At one point she asked me a particularly tricky sum. After some consideration, my reply was, “How should I bloody know? !” We think we have worked it out now and have joined most of it together. The next thing to do is to fit it onto the frame to see what happens next. We have even worked out how to connect the roof to what is going around the walls – thin offcuts of quilted tweed will punctuate each panel with velcro and top loops. I had a day off from yurting on Saturday for the Regional Day. There were 2 super speakers, Christine Porter and Sheena Norquay. I have asked Sheena Norquay if I can interview her for the Podcast. I was fascinated by her printed and stitched pieces and would love to do a workshop with her at some stage. We stopped for Fish & Chips on the way home and ate them in the car, overlooking the sea with steamed up windows. We even had locally caught calamari which the best I have ever had. I spent 12 hours working on a custom Double Wedding Ring kingsized quilt on Sunday and only got near to halfway through before I ran out of thread. I had turned this job away a few weeks ago, explaining about the schedule for the exhibition but the customer was extremely keen that I should do it for her daughter’s wedding in May. I caved in eventually but I want to have it done within 3 days or I may have a nervous breakdown. I hope Barnyarns has the thread in stock and can get it here by Tuesday. I have also decided that I need to increase my quilting charges! I will have to get on with making the tweed joining sections and piecing my last yurt panel until I can get the frame clear again. I have invited Ferret for the weekend of the 3rd and 4th July as I will be running my first longarm Summer Camp. It will not be exclusively for APQS owners, although there will be a technical class. I still have to put together a proper programme and work out costs but there will be gadgets, freehanding and whatever else I think will be popular. It was fun to have a Skype video call with Connie in Virginia the other night. She was able to hold up the Amish String Star that she has done for the yurt. I am so amazed by technology when you can do things like that. I thought I would share the poem that Ellen sent me about spending so much time on the computer…! I have spent very available moment this week quilting large rectangles of wool tweed that will be cut into triangular shapes to form sections for the round yurt roof. I press-ganged Tania into helping me cut and piece the sections that were not long enough into stripey sections. The tweed was not particularly co-operative as it tends to stretch alarmingly. I had just enough backing fabric and not quite enough of the industrial strength wadding that is so bristly that it could be used to make pot scrubbers. I managed to piece a bit of reject poly wadding and some extra fluffy stuff for the last section. I am so glad that I suddenly decided to quilt all of the roof sections the same in long straight lines using the channel locks. Well, they are quite straight – there is the odd wobble and they not all exactly the same distance apart. The overall effect is fantastic, just like sheets of corrugated iron that are used on so many old farm buildings or the quilted outfits that I have seen photos of Mongolians wearing to keep out the wind. It is as if I made the decision consciously bearing all of these design features in mind…I have realised that I need to start jotting down interesting vocabulary if I want to write a serious book about the project with lots of pretentious references and arty-farty statements. Despite having a foul cold, I kept slogging on with the roof pieces and should have the whole lot done by the end of Monday. I treated my cold with lots of red wine and a Cadbury’s Crème Egg, contrary to the Government healthy-living advice. According to the Government’s latest campaign about women drinking too much wine, I will be dead soon so I’d better make sure that I enjoy life while it lasts! I only had one outing this week to the Farm Supplies Store where I bought a new, galvanised poultry drinker and a sack of dog muesli. I ordered a box of thread over the Internet and wondered if I should plan an outfit to wear when I am interviewed for British Patchwork & Quilting Magazine. I don’t want to look like an overweight 40+ quilter who lives in jeans and a woolly sweater – I want people to think that I’m really trendy. If I do get dressed up to have my photo taken I will have to get changed straight afterwards because I will just feel uncomfortable and cold. I had no success with “Furniture @ Work” refunding my money for the office screen so now I have written an official letter that requires a response within 14 days or I will refer my complaint to Trading Standards – it is all such a waste of my precious time! Another time wasting exercise will be phoning Dell to complain about my new and broken wireless mouse. I have changed the batteries, reinstalled the software and shaken it but it is still not talking to the computer. The Podcast microphone has arrived along with a huge manual in several languages. I will have to find time to figure out how to operate yet another gadget and its associated editing software. I have a nasty feeling that there is a Parent Council meeting at my children’s school this week; as Chairperson I really should go over the paperwork and make some overdue phone calls beforehand. Perhaps Spring is on its way…the snow has been melting at last and a new Boiler Man came and replaced yet another part of the boiler so the house no longer reeks of kerosene fumes. George the Builder came to discuss taps for the ancient workshop sink that has never had running water. But The Farmer and the Bus Driver still reckon that there is a threat of snow over the next few weeks. 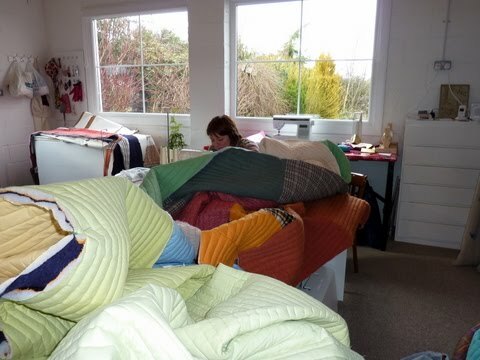 I have had a couple of clients call and ask why their quilts have not been finished – they had forgotten that I said I wouldn’t be doing anything apart from the yurt until after May. 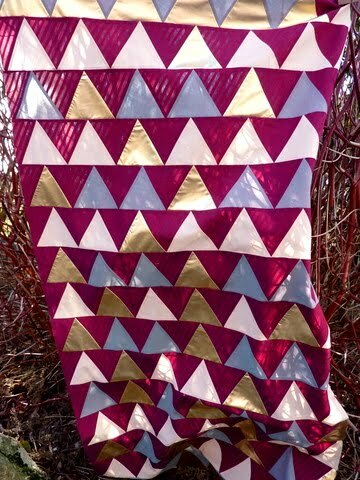 I have decided that I will try to piece one more yurt panel with equilateral triangles since I have had a revelation over the Shrinking Dutch Triangles. I now know exactly how to join them together without losing the points but I had re-cut some of the Dutch triangles using the smaller, metric template and still have lots of them in an imperial size. Instead of dealing with them and making them all match, I have packed them back into their brown envelope and shut the drawer for a day when I have nothing else to do.